Vote Labour Button Badges. 2017 General Election. If you are voting labour in the upcoming general elections this is the perfect badge for you. 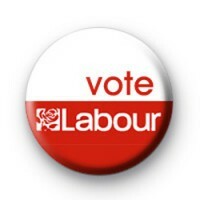 Red & white vote labour badge for all the supporters of Jeremy Corbyn and the labour party.